The African, rockhopper and little blue penguins here at the Aquarium allow visitors to get to know three very interesting penguin species. There are 15 other interesting penguin species in the world just waiting for you to discover them. Over the next couple weeks, we will introduce more penguin species! Yellow-eyed penguins are found off the southern coast of New Zealand and the sub-Antarctic islands of Auckland and Campbell. 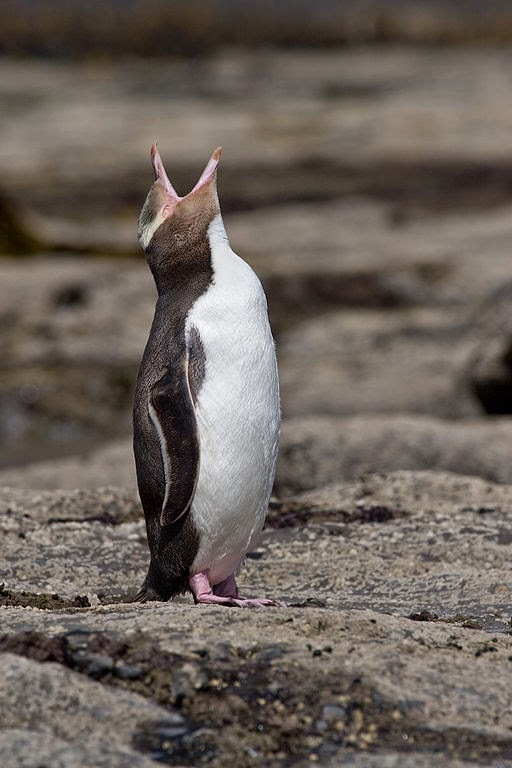 The yellow eyed penguin is the largest species of temperate climate penguins; standing at about 25-30 inches and weighing in between 12–18 pounds. 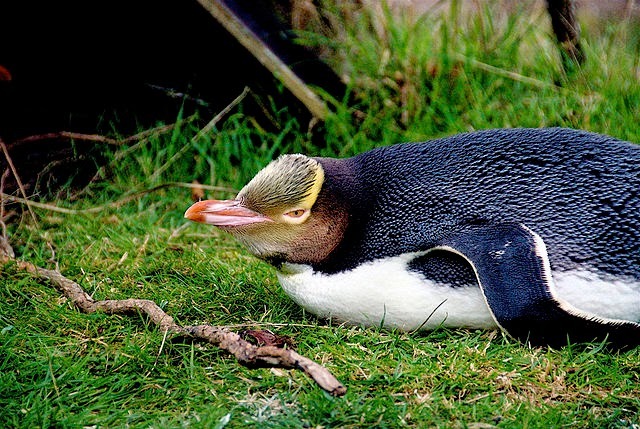 The Maori tribes of New Zealand call the yellow eyed penguin hoiho which means noise shouter and refers to the shrill calls of the penguins. In addition to their unique appearance yellow eyed penguins are unique in the fact that they do not breed in large crowded colonies. Unlike most penguin species that breed in very close proximity to their neighbors, yellow eyed penguins breed in the coastal forests of New Zealand and prefer to not be in eyesight of other breeding pairs. Yellow eyed penguins are endangered, with only about 4000 individuals remaining. Deforestation is a major factor in their population decline. Their breeding habitats have been cleared to make pastures for livestock. The introduction of foxes and stoats (a weasel-like animal) in the early 1800’s also added extra pressure to a declining population. 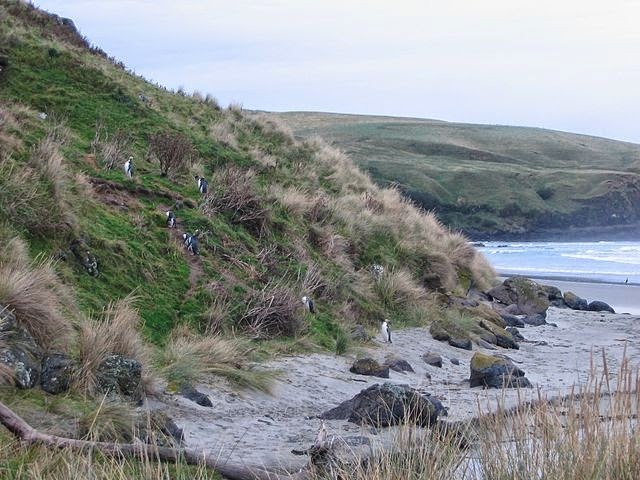 To help protect these unique penguins many conservation groups (like this) have been set up throughout New Zealand and many of the yellow-eye penguins breeding areas have been made protected areas. Stay tuned to the blog to learn more about other fascinating penguin species. Love penguins? Get to know macaroni penguins in this previous post. Better yet, come visit the Aquarium to see three species of penguin up close! There's so much to learn about these amazing little birds, so don't miss our exciting summer program called Penguinology.